Oxidative stress has been proposed to be involved in the pathogenesis of Parkinson's disease (PD). A plausible source of oxidative stress in nigral dopaminergic neurons is the redox reactions that specifically involve dopamine and produce various toxic molecules, i.e., free radicals and quinone species. α-Synuclein, a protein found in Lewy bodies characteristic of PD, is also thought to be involved in the pathogenesis of PD and point mutations and multiplications in the gene coding for α-synuclein have been found in familial forms of PD. We used dopaminergic human neuroblastoma BE(2)-M17 cell lines stably transfected with WT or A30P mutant α-synuclein to characterize the effect of α-synuclein on dopamine toxicity. Cellular toxicity was analyzed by lactate dehydrogenase assay and by fluorescence-activated cell sorter analysis. 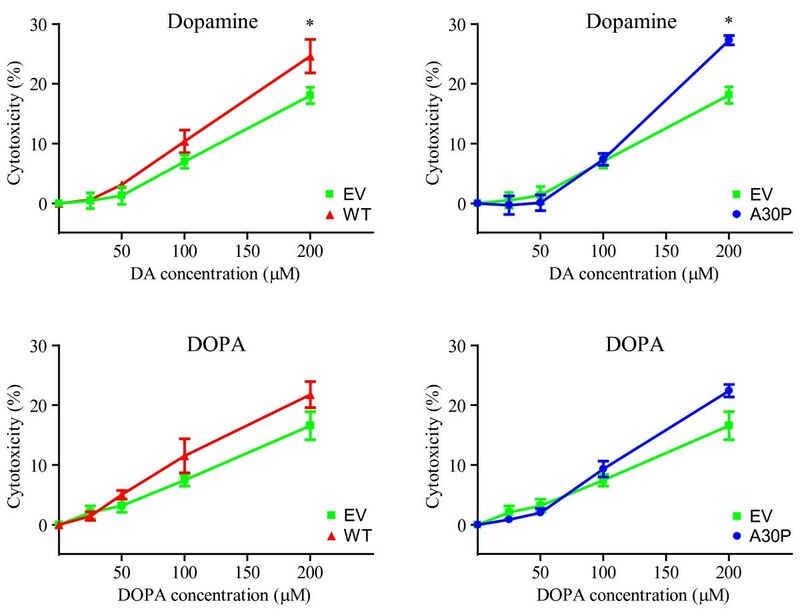 Increased expression of either wild-type or mutant α-synuclein enhances the cellular toxicity induced by the accumulation of intracellular dopamine or DOPA. Our results suggest that an interplay between dopamine and α-synuclein can cause cell death in a neuron-like background. The data presented here are compatible with several models of cytotoxicity, including the formation of α-synuclein oligomers and impairment of the lysosomal degradation. Parkinson's disease (PD) is a common neurodegenerative disorder characterized by symptoms that include resting tremor, slowness of movement, rigidity and postural imbalance. PD is a chronic and progressive disease caused by degeneration of several neuronal populations in the brain, most notably the dopaminergic neuromelanin-containing neurons of the substantia nigra (SN) pars compacta. While the etiopathogenesis of idiopathic PD remains poorly understood, post mortem studies support the involvement of oxidative stress and the production of reactive oxygen species in neuronal damage [2, 3]. Redox reactions that specifically involve dopamine (DA) are a possible source of oxidative stress accounting for the more pronounced degeneration of dopaminergic neurons in PD. A critical determinant of DA toxicity is the amount of DA present in the cytoplasm, outside of the acidic stabilizing environment of the synaptic vesicles where the neurotransmitter is normally confined. In the cytoplasm, DA can undergo both spontaneous or enzymatic-mediated oxidation and, as a consequence, generate superoxide anions, hydrogen peroxide and quinones , which can damage cellular components such as lipids, proteins and DNA [5–8]. Neuropathologically, PD is characterized by the presence of intracellular ubiquitinated inclusions, known as Lewy bodies, composed predominantly of fibrillar α-synuclein [9, 10]. The discovery of three different missense mutations in the SNCA gene that codes for the α-synuclein protein, found in rare familial forms of PD indicates that α-synuclein is a likely causal factor in the pathogenesis of PD [11–13]. Further supporting this contention, multiplications of the SNCA gene are also causal for PD, suggesting that simply increasing the amount of protein is sufficient to trigger the disease . Human α-synuclein is a small, 140-residue, natively unfolded protein abundantly expressed in neurons, where it is localized at presynaptic terminals [15–18]. The physiological role of α-synuclein is still poorly understood. Possible key functions of the protein could be the modulation of synaptic vesicle recycling, DA storage and release at nerve terminals [19–24]. In addition, α-synuclein could modulate intracellular DA handling through interactions with proteins that regulate DA synthesis and uptake, such as tyrosine hydroxylase , the aromatic amino acid decarboxylase  and plasma membrane dopamine transporter [27–29]. To explore the possibility of a synergistic effect between oxidative cellular conditions induced by the oxidation of DA and α-synuclein in PD, we investigated how wild-type (WT) α-synuclein or its A30P pathogenic mutant influences DA toxicity in a dopaminergic human neuroblastoma BE(2)-M17 cell model stably over-expressing α-synuclein. The production of stable cell lines overexpressing α-synuclein from parental BE(2)-M17 human dopaminergic neuroblastoma cells has been described elsewhere . Cells were cultured in high-glucose DMEM (Life Technologies) supplemented with 10% FBS, 50 U/ml penicillin, 50 μg/ml streptomycin and 500 μg/ml G418. α-Synuclein expression was evaluated by Western blot analysis, using monoclonal anti-α-synuclein antibodies (BD Biosciences), after cell lysis and protein separation on SDS-PAGE. Films were analyzed with ImageJ (Rasband, W.S., ImageJ, U.S. National Institutes of Health, Bethesda, Maryland, USA, http://rsb.info.nih.gov/ij/) for densitometry quantification and protein levels were normalized with respect to β-actin. Cells were plated in 96 well plates at 1.5 × 104 cells per well in 100 μl of OptiMEM growth medium (Life Technologies) supplemented with DA or DOPA between 25 and 200 μM. Hydrogen peroxide generated by extracellular catecholamine oxidation was removed by adding 600 U/ml catalase (Sigma-Aldrich). After 24 hr of incubation, LDH activity measurements were performed using a commercially available assay (Roche Applied Science) according to the manufacturer's instructions. The ratio of LDH activity in the supernatant to the total LDH activity was taken as the percentage of cell death. For each experiment, eight wells per concentration were averaged and each experiment was performed in triplicate. After 24 hr of incubation in the presence of 200 μM DA or DOPA, 106 cells/ml were labeled with Hoechst 33342 and propidium iodide (Vybrant Apoptosis Assay Kit #5; Molecular Probes, Invitrogen), according to manufacturer's specifications. Cells were analyzed using a dual-laser FACSVantage SE flow cytometer (Becton Dickinson, Mountain View, CA, USA). Propidium iodide was excited using a 488-nm laser light and the emission captured with a bandpass filter set at 613 ± 20 nm. Hoechst 33342 was excited using a 351-nm ultraviolet laser light and its emission captured with a bandpass filter set at 450 ± 20 nm. Cell Quest Acquisition and Analysis software (Becton Dickinson) was used to acquire and quantify the fluorescence signal intensities and to graph the data as bivariate dot density plots. Data were analyzed using GraphPad Prism 4 software and are expressed as the mean ± SEM. One-way ANOVA followed by Newman-Keuls's post hoc test was used to determine whether groups were statistically different. P values < 0.05 were considered significant. To study the relationship between α-synuclein and catecholamine toxicity, we used dopaminergic human neuroblastoma BE(2)-M17 cell lines stably transfected with WT or A30P mutant α-synuclein, as previously described . 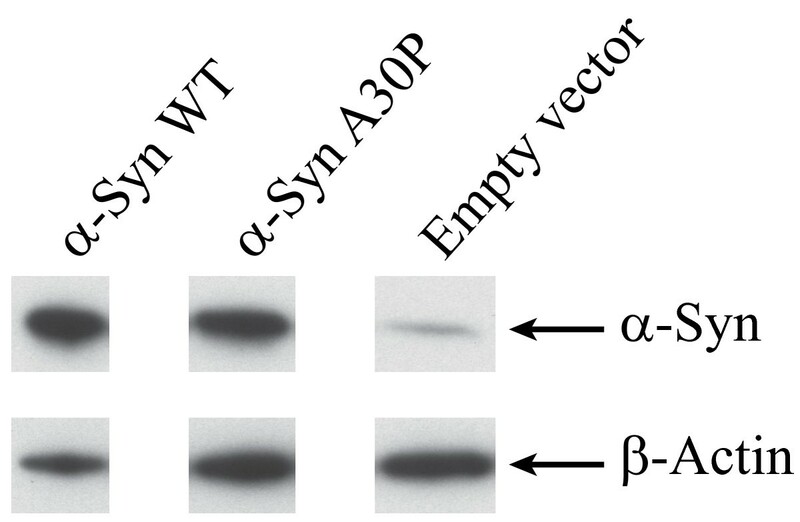 The expression levels of WT and A30P α-synuclein were, respectively, about 8 and 6 times higher than cells transfected with the empty vector (Figure 1). Each cell line (empty vector control, WT or A30P α-synuclein) was treated with increasing concentrations (25, 50, 100 and 200 μM) of DA or DOPA, the cellular precursor of DA, and the levels of cellular toxicity were determined using an LDH assay. To limit the analysis only to the intracellular effects of DA or DOPA oxidation, we added 600 U/ml of catalase in the growth medium, as described for SH-SY5Y and PC12 cell types [31, 32]. As expected, the presence of DA or DOPA in the growth medium induced cellular damage in all cell lines. The level of cell death was approximately 15% in the presence of the highest amount of catecholamines used in these experiments (200 μM) (Figure 2). Cells overexpressing WT or A30P α-synuclein showed an increased vulnerability to DA or DOPA-mediated toxicity (Figure 2), with a level of cellular death up to ~ 25% compared to controls. The toxicity induced by DA or DOPA was similar. Expression levels of α-synuclein in stably transfected M17 cell line. Immunoblot of α-synuclein in cell lines overexpressing WT or A30P α-synuclein using a monoclonal antibody against α-synuclein (upper panel). The same immunoblot was then stripped and reprobed with an antibody for β-actin (lower panel). Quantitation of α-synuclein is expressed as a ratio between the major α-synuclein band and β-actin. Cells transfected with vector alone show moderate expression of α-synuclein compared to cells overexpressing WT or A30P α-synuclein. To confirm that overexpression of α-synuclein increases cell vulnerability to DA or DOPA, we performed analysis by fluorescence-activated cell sorting to discriminate between necrosis and apoptosis . The analysis of 2 × 104 cells, obtained after 24 hr of incubation in the presence of 200 μM DA or DOPA, is shown in additional file 1. Figure 3 summarizes the results derived from 4 independent experiments. 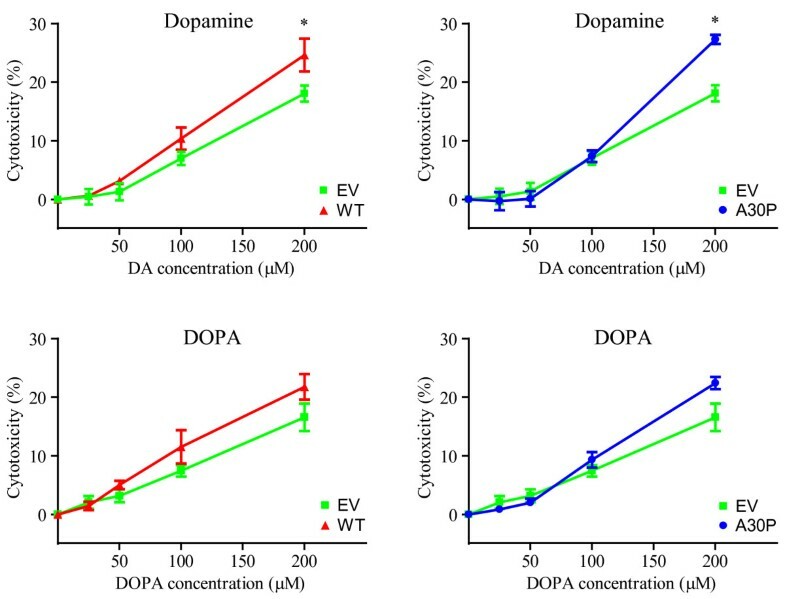 Addition of DA or DOPA to cells transfected with empty vector increased both apoptotic and necrotic events with a decrease in viability from 89% (control) to 62% (DA) and to 70% (DOPA). Although the cellular growth rate was similar both for empty vector and α-synuclein overexpressing cells, the presence of WT or A30P α-synuclein had cytotoxic effects with a decrease in viability from 89% to 66% (WT) and to 73% (A30P). The overexpression of WT or A30P α-synuclein variants also increased cellular susceptibility to DA or DOPA, especially for apoptotic cell death. The viability of cells overexpressing WT α-synuclein decreased from 89% to 32% (DA) and to 26% (DOPA), with and a change in viability of 57% and 63%, respectively. In the case of A30P overexpression, viability decreased from 89% to 39% (DA) and to 43% (DOPA), with a change in viability of 50% and 46%, respectively. Results obtained for each condition tested are summarized in Table 1. These data suggest that the cytotoxicity of α-synuclein and DA/DOPA are greater than the sum of the individual effects. DA and DOPA augment α-synuclein mediated apoptosis and necrosis. Decreased cell viability (A) induced by DA or DOPA is accompanied by increased apoptosis (B) and necrosis (C). After 24 hr of incubation in the presence of 200 μM DA or DOPA, cells were labeled with Hoechst 33342 and propidium iodide and analyzed by FACS. For each experiment, 1.5-3 × 104 cells were analyzed. Values are the mean ± SEM (n = 4). * p < 0.05, ** p < 0.01, *** p < 0.001 relative to EV. FACS measurements were carried out on cells transfected with empty vector (EV), WT or A30P α-synuclein variants, after 24 hr of incubation in the absence (CNTR) or in the presence of 200 μM DA or DOPA. Oxidative stress and α-synuclein are considered two potential factors involved in the pathogenesis of PD. An important source of oxidative species is cytoplasmic DA which may contribute to the preferential neuronal death of catecholaminergic neurons observed in PD . Previous studies have shown a direct correlation between α-synuclein and oxidized DA. In cell-free systems, oxidized DA can covalently modify α-synuclein and promote the stabilization of toxic protofibrils . Moreover, degradation of α-synuclein through the chaperone-mediated autophagic pathway is impaired when the protein is modified by oxidized DA . In the present work, we explored the combined effects of α-synuclein and DA in promoting cellular toxicity. The influence of α-synuclein on DA toxicity has been previously been mainly studied in transiently transfected cells or under inducible expression conditions [37–41]. In this study, we used stable transfected dopaminergic human neuroblastoma BE(2)-M17 cell lines expressing WT or A30P α-synuclein . We found that the presence of either WT or mutant α-synuclein increase susceptibility to oxidative conditions induced by DA in this model. Increased susceptibility to oxidative conditions upon WT or mutant α-synuclein overexpression is in agreement with studies using transient overexpresssion or inducible cell lines [37–41], but are in contrast with one previous study carried out using WT α-synuclein stably transfected SH-SY5Y cells . The observed discrepancy is unlikely to be due to the fact that different cell lines were used as SY5Y cells have previously been shown to be susceptible to toxic effects of α-synuclein in a dopamine-dependent manner  but may be due to the choice of cytotoxicity assays, as catecholamines have been shown to interfere with MTT assay . Because of this potential concern about interference of catecholamines with colorimetric assays, we used FACS analysis to confirm results seen in LDH release assays. This method allowed us to confirm that DA exposure and α-synuclein expression have additive toxic effects. One possible interpretation for two observations described in this study, the toxicity measured in cells over expressing both WT and A30P α-synuclein relative to the control and the synergistic toxicity of α-synuclein and DA is that α-synuclein may have an effect on DA metabolism. It has previously been reported that overexpression of WT or mutant α-synuclein in PC12 cells  or in differentiated MESC2.10 cells , increases cytosolic catecholamine concentration. In contrast, the levels of cytosolic DA in adrenal chromaffin cells from mice over expressing human α-synuclein or from knock-out mice are unaltered compared to wild type animals [42, 43], suggesting that the observation of the DA homeostasis effect by α-synuclein may be influenced by cell line. As we have not directly measured cytoplasmic DA concentrations in this cell line, further experiments are needed to define whether α-synuclein affects DA homeostasis in this context. Another possible mechanism that may contribute to the combined toxic effects of α-synuclein and DA is the interaction between α-synuclein and the oxidation products of DA. In support of this hypothesis, we have shown in vitro that α-synuclein is able to incorporate radiolabeled DA . The mechanism(s) underlying the potentially toxic effects of DA-modified α-synuclein are unclear. One leading hypothesis is that quinone adducts of α-synuclein may stabilize protofibrils . Additionally, DA-modified α-synuclein blocks degradation of long-lived by chaperone mediated autophagy , an effect that can be seen with A30P α-synuclein without the incubation of the protein with DA . Therefore, both impairment of the autophagy degradation and the formation of α-synuclein oligomers may both contribute to the observed cytotoxicity. Detergent-stable α-synuclein oligomers can isolated from DA-treated cells  and non-denaturing size fractionation also identifies non-covalent oligomers of α-synuclein in catecholaminergic cells . However, whether these oligomers are specific to DA treatment, and therefore the same as the putative toxic species seen in vitro, is difficult to test as DA-modified α-synuclein has not yet been shown to be stable enough to be detected in vivo. Further work is therefore needed to establish whether the effects of DA and α-synuclein are mediated through direct interaction or independent pathways. In summary, we have shown that DA exposure increases the toxicity of the PD-related protein α-synuclein in dopaminergic neuroblastoma cell lines BE(2)-M17. These results support the concept that DA, likely through formation of cytosolic quinones, has synergistic toxic effects with α-synuclein. While additional studies are required to define the precise mechanism(s) by which the two stressors act in a cellular context, our results further highlight that an interaction between cytosolic DA and α-synuclein may underlie the susceptibility of SN neurons in PD. Marco Bisaglia, Elisa Greggio contributed equally to this work. This work was funded by grants from the Italian Ministry of Education, University and Research, MIUR-PRIN and MIUR-FIRB, (L.B.) and in part by the Intramural Research Program of the NIH, National Institute on Aging, project number 1 Z01 AG000953 (M.R.C.). M.B. was supported through an EMBO short term fellowship. MB, EG, DWM, MRC and LB designed experiments, MB, EG, DM and DWM carried out experiments, MB, EG, MRC and LB wrote the paper. All authors read and approved the manuscript.